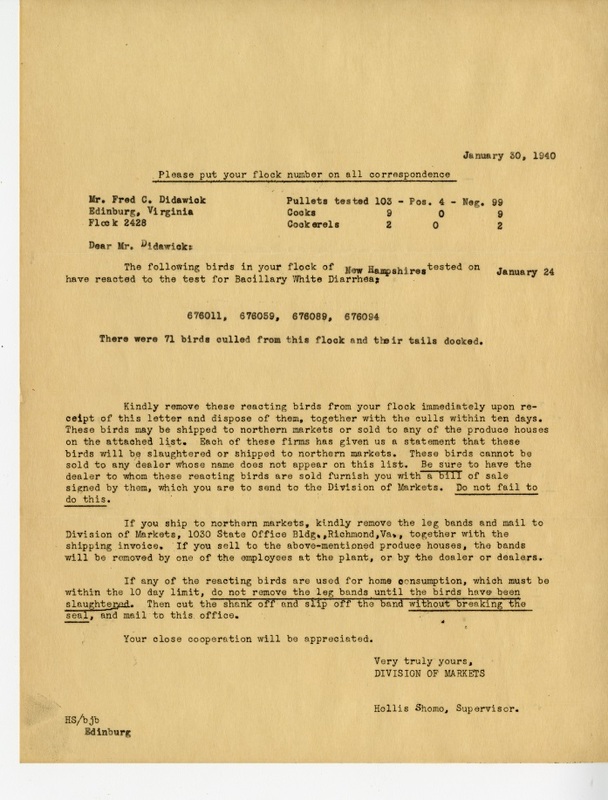 Letter sent from the Virginia Department of Agriculture, Division of Markets, to Fred C. Didawick of the Edinburg Hatchery outlining test results conducted for the Bacillary White Diarrhea disease among the hatchery's chickens. The results announced that 71 birds had been identified with the disease and must be slaughtered or sold immediately. FOLDER 1.21 Edinburg Hatchery Corespondence, 1 of 3, 1939-1940, Valley Business Collection, Truban Archives, Shenandoah County Library, Edinburg, Virginia. 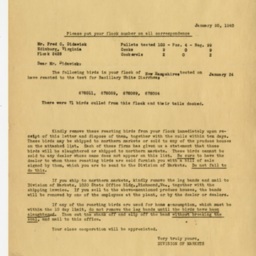 Shomo Hollis, Virginia Department of Agriculture, Division of Markets,, “Bacillary White Diarrhea Test Letter,” Shenandoah County Library Archives, accessed April 25, 2019, http://archives.countylib.org/items/show/11736.